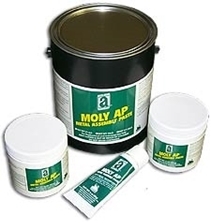 MOLY-AP™ - Metal Assembly Paste is an extreme-pressure lubricant for metal assembly and maintenance. Reduces wear on parts during breaking-in and new-parts assembly. Temperature Range: Solids are effective from 0° to 750°F (-18° to 399°C); base oil vehicle 0° to 250°F(-18° to 121°C). Applications: Lubricating threaded connections, gears, chains, conveyor tracks, lubricating during metal forming, general parts assembly, press-fitting, cold extrusion, breaking-in of bearings, movable screws, splines, cams, and more.